Flavour bombs. Growing up in Asia I have always taken for granted the richness of flavours in our food. When I was doing my fellowship in Columbia Uni, I had a fellow lab rat who was Dutch and I was always taken aback that his lunch would comprise a cheese sandwich and a carton of milk. Every. Single. Day. Oh wait – maybe once in a week or two he would have a slice of pizza from the pizzeria round the corner. Working in a lab was really fun in my 2 years in NY because we were a truly international lab with people from all over the world. So we started a tradition of going out together once a month and visiting restaurants that represented each person’s culture or racial background. I must say I had some of the best Filipino food I ever had in my life (black rice paella no less), not to mention truly awesome Indian and Chinese food. During my turn I brought my friends to the now defunct Penang Restaurant, which was one of the more authentic Malaysian-Singaporean type restaurants around in NY at that time. Usually when we got back after lunch we all couldn’t work or think because we had eaten too much…i think we were only fit for washing beakers the rest of the afternoon. Anyway we never went with the Dutch guy’s suggestions because we weren’t very impressed by his lunches. Meatballs are a truly international food and from spag & meatballs to Swedish meatballs we are all familiar with this cheap and good dish. It’s a fantastic food – what kid doesn’t like meatballs right? The problem with meatballs however is that they often hide hidden carbs – most meatballs are made softer by adding breadcrumbs. I usually get around this by adding breadcrumbs from my low carb bread or wafers (WASA light crackers are relatively low carb) or just do without. These lemongrass pork meatballs come without any breadcrumbs and are a little denser than some may like, but the flavours are awesome and have some Thai accents. This dish can be taken on its own, on a bed of shirataki noodles or maybe cauliflower rice (both great low carb substitutes too). To make the meatballs, discard the outer layer of the lemongrass and expose the pale yellow inner stalk. Thinly slice the lemongrass into rounds until the hard upper stalk. Discard the upper stalk. Transfer the lemongrass rounds into a food processor and pulse till finely minced. Take out 1 ½ tbsp minced lemongrass. Combine the minced lemongrass, pork mince, shallots, fish sauce, arrowroot flour, chilli, garlic, sugar substitute and salt in a large bowl and mix well. Cover and refrigerate for about 1 – 4 hours to let the flavours develop. Shape the meat into small meatballs. Lightly fry over low heat in a non-stick skillet about 4 minutes each. Set aside. To make the dipping sauce, bring 1/4 cup water and sugar to boil in a saucepan over high heat. Pour into a bowl to cool down. Then add the fish sauce, vinegar, garlic, chillis, shredded carrots and scallions and mix well. 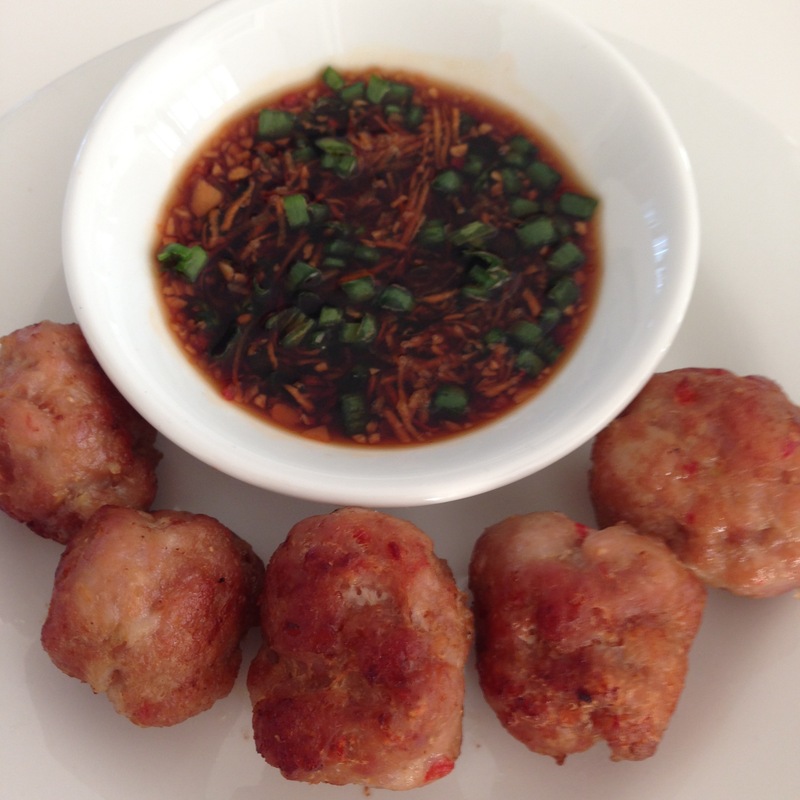 Serve meatballs together with dipping sauce. I’m gonna try this for my kids tonight! With sugar and corn starch.. I love non traditional spins on meatballs- I’m not a big fan of the Italian ones. Thanks for the idea!